Correct response: Who is Mariah Carey? 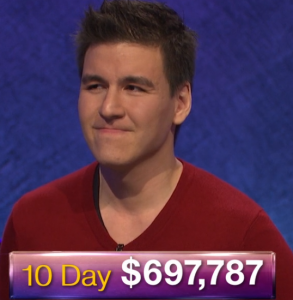 I’m not sure why Jeopardy! 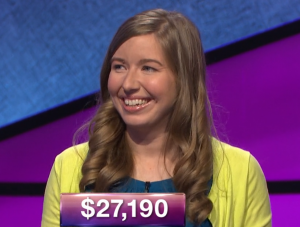 insists on using WOMEN or FEMALE in a category title, especially in Final Jeopardy!, especially as MEN or MALE don’t show up in category titles. Yesterday’s clue would have held up just fine as just WRITERS (after all, “her” was used in the clue yesterday), and again, there’s “her” in the clue today. That should be sufficient. Now, onto the clue: The 8 #1 songs in Mariah Carey’s first 10 hits were: “Vision of Love”, “Love Takes Time”, “Someday”, “I Don’t Wanna Cry”, “Emotions”, “I’ll Be There”, “Dreamlover”, and “Hero”, all released between 1990 and 1993. The other 2 were “Can’t Let Go” (#2) and “Make It Happen” (#5). Over her career, Mariah has had 18 #1 songs to date. An average of 3.8638 5+-time champions (standard deviation 1.646). An average of 6.9866 4+-time champions (standard deviation 2.0284). An early cutoff took place 5.975% of the time (or a 5-game winner will be left out). 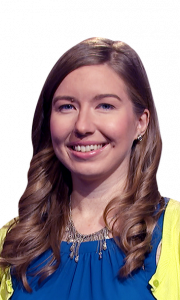 Meghan Schulz qualified 5.486% of the time. Anneke Garcia qualified 81.165% of the time. Dave Leffler qualified 62.213% of the time. 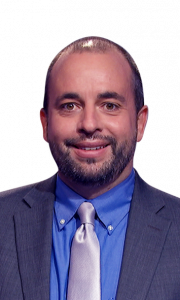 Jonathan Dinerstein qualified 36.263% of the time. Alex Schmidt qualified 13.192% of the time. John Presloid qualified 3.551% of the time. Jackie Fuchs qualified 0.467% of the time. The MISCELLANEOUS category: $200 “llama”, $400 “Rama”, $600 “lama”, $800 “ramen”, $1000 “ding-dong”. This is why it’s easier to take categories in order. With regards to that $800 I BEFORE E, AFTER C clue: While Britannica spells it “bocce”, as does the United States Bocce Federation, Merriam-Webster spells it “boccie”, as does Collins. Certainly not a clue choice I agree with, especially considering Joan didn’t give her response because she clearly knew of the “bocce” spelling (and not the “boccie” spelling), but two major dictionaries do spell it that way. Piling on here in the comments section may not be the best course of action; the Jeopardy! contact form can be found here. 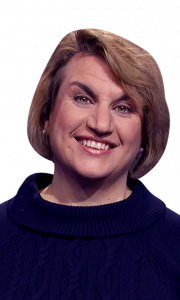 Moreover, that sort of mistake messes up a contestant’s confidence, as was evidenced by Joan on the $1600 clue in BIO PICKED, about the composer in Immortal Beloved. That clue said 1994, but if you lose trust in the writers, and think “maybe they meant 1984?”, you guess “Amadeus”. No, this does not meet the standard for “bringing a contestant back”; the $800 I think Joan should have been refunded would not have made a difference in the outcome, as the show generally uses the economic principle of “holding everything else constant” / “ceteris paribus” when it comes to these matters. I don’t know why Meghan was trying to avoid the Daily Doubles; they would have done her a lot of good! I reckon I’ll be waiting awhile for the large cadre of people who don’t actually know strategy regarding J.B.’s bet on the last Daily Double. The last time this happened, there seemed to be a lot of people mad at the contestant for betting for the lead. This time it worked — because it is clearly the best option. Tonight’s game had 17 negs. The record is 23. 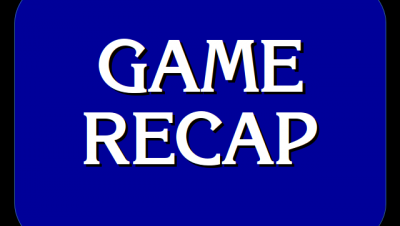 3 Comments on "Today’s Final Jeopardy – January 31, 2019"
I couldn’t guess anything. Give me 50’s and 60’s and I might do well, because music from those times. I know and recognize Mariah Carey but by the 90’s I was heavily involved in life’s activities and not keeping track everybody’s hit songs. Messed up the middle because text misbehaves on my tablet and I don’t always catch it before I post.